The small green monster Om Nom is back and hungry again! Join forces together with a professor who decided to study the behavior of Om Noma through a series of insane experiments. 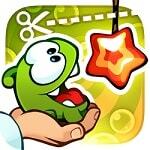 Pass all 200 levels and discover hidden secrets!